We both love our indian alphonso mangoes. Even more so, since it is a rarity in the UK. Fortunately in the last couple of years the UK asian shops do make special efforts to stock up on the alphonso and the honey dew mangoes. Both varieties are seasonal, intensely flavored and honey sweet. Our dear friends picked up a big box of alphonso mangoes for us last weekend. We could hardly wait for them to ripen. The aroma of mangoes ripening in the kitchen is undescribable.....the mangoes were juicy, sweet and simply delicious. I wanted to try and make a fresh cream pastry using these mangoes and thus the inspiration for this recipe. 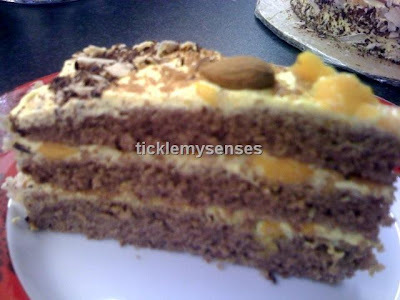 I made another one for a friends party..two days later..they simply loved the gateau. As the recipe has been requested I have decided to post it here for you to try and enjoy. For all mango lovers........the best way to have this golden beauty is on its own, but for an exotic twist..... this recipe will leave you for wanting more. This recipe has 4 basic steps. Step 1- make the sponges for the gateau. Step 2- make the creamy mango filling. This recipe will give you a cocoa flavoured sponge, for a plain sponge replace the cocoa with plain flour. Part-1 Make the sponge- 3 seperate layers. 1. Preheat the oven to 200˚C/Gas 6. 2. Base-line a 23cm loose-based cake tin with baking parchment and brush the base and sides with a little sunflower oil to grease. 3.Then sieve together flour, cornflour and baking powder once . 4. Fold in the flour a little at a time to get a homogenous mix. 5. Spread roughly one-third (1/3 ) of the mixture into the prepared cake tin and bake in the centre of the fan assisted oven for 9 minutes. Remove, cool for a few minutes then turn out onto a wire rack and peel off the baking parchment. Wash the tin, base-line and grease once more. Repeat the method 2 more times until you have 3 even-sized sponges. Leave the sponges to cool on a wire rack. 1. To make the filling and topping, whip 200ml double cream to soft peaks with 5-6tbsp sugar. . taste cream for sweetness and add more sugar only if required. 2. Puree 1 and half fresh mango with 2tbsp liquer in a blender. Fold in this puree with the whipped cream. 3. Add 1/2 mango chopped into small pieces to the mixture. 1. Dissolve sugar in 30ml warm water. Add liquer to it. For a non alcoholic version you can use 30ml of syrup from canned fruit. 1. Place one of the sponges on a serving plate, dribble a few tsps of syrup over sponge to moisten it, spread one third of the mango cream filling evenly. Repeat the method until the cakes are stacked one on top of the other with the mango filling between the layers. 2. Pour the remaining mango cream mixture over the cake and cover top and sides completely. 3. Place in the fridge for an hour to set. 4. 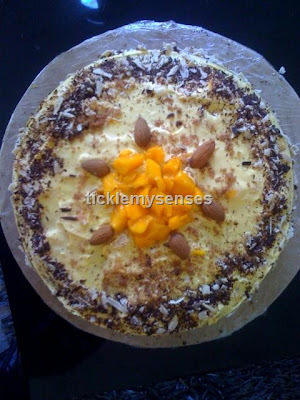 The first time i made this gateau i decorated it with with white and dark chocolate shavings and roasted almonds. The second time i made this gateau i used mango jelly to decorate the top with a slice of fresh mango and a dusting of cocoa. Tastes best when served a day later. As this is my first post ever id be happy to receive your comments on this recipe. Enjoy.